I love this book for teaching the letters and their sounds really fast.The rhymes and picture cards are great for teaching children using all three learning styles. Kids get to act out the letter sounds as they say the rhymes. Kids love it because they love being the letter expert for a certain letter. We still celebrate a letter a week just so we can do fun things with it, but we do not teach a letter a week. We teach all of the letters all of the time. I make a large class book to use when introducing the letters and rhymes and for students to read during their free reading time. I take a set of the picture cards and their rhymes and post them as a bulletin board for easy reference when we working. Did the book come with picture cards or where do you get those? The book cake with the cards. I typed the large text for the big book I made. The book has cards with smaller text. Having trouble figuring out what to use for emergent-level books. What do you use? I used a set that I purchased from Scholastic. There was one reader for each letter of the alphabet. Did you recently purchase the set from Scholastic or was it something you already had? Thanks! The set is one I purchased several years ago. 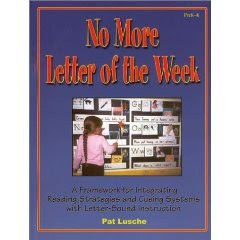 Do you still use No more letter of the week? In the book is a page that has all the sound card pictures on one page. Is there anyway I can get a copy of that page?? Jessie Bear, What Will You Wear? Somebody Loves You Like I Do!